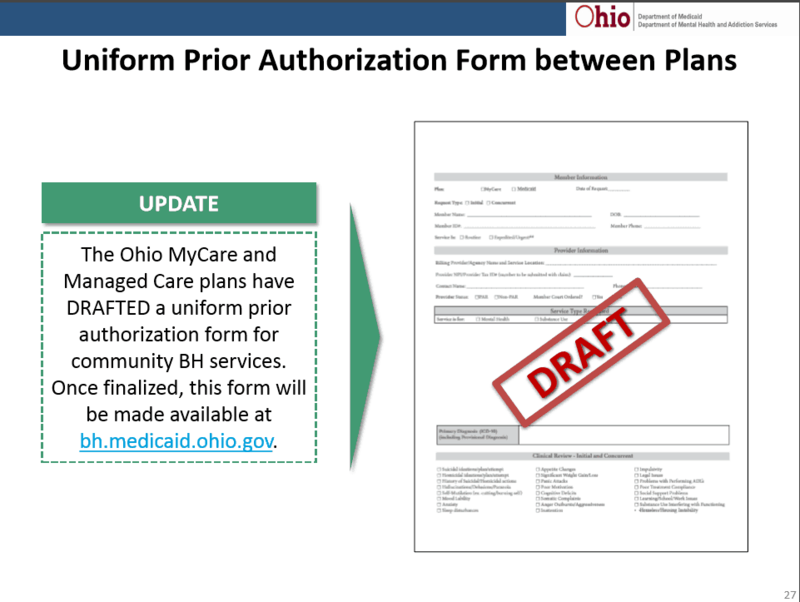 On Wednesday, September 13th, two important group meetings were held at Ohio Medicaid, the Benefit and Services Work Group and the EDI Medicaid Work Group, releasing a significant amount of information about the Redesign. This includes Beta Testing guidelines, Health Home changes, updates to the timeline and the states attempt to adhere by the legal guidelines put in place by the Senate and House to justify successful testing. 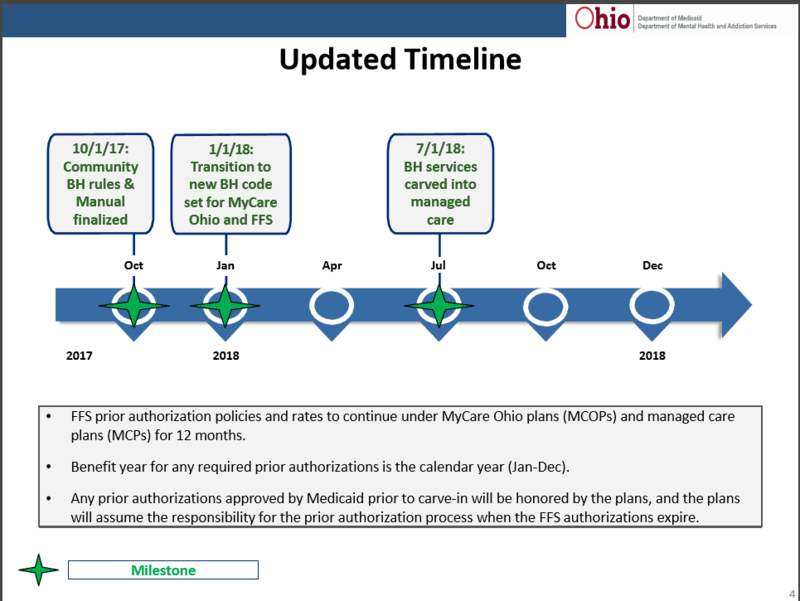 The timeline is below with Ohio BH Redesign AND MyCare plans going live with the new redesign code set on January 1st, 2018. Click the links in RED for full power points from both groups. 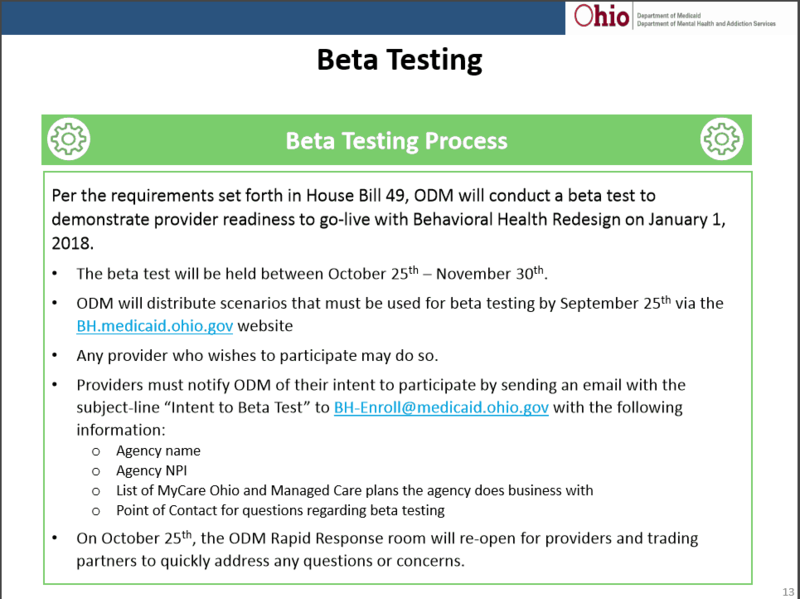 Testing will open October 25th – November 30th for ALL BH agencies in Ohio. However, the testing that will be tracked and reported back to legislators will be agencies in the “Beta Testing” group. Set guidelines for the code set to test and how to test will be released September 25th. To become a “Beta Tester”, see below. Note: You must notify ODM of your intent to become a beta tester and if you are in a MyCare area, you must be prepared to test FFS claims AND MyCare in order to be included. 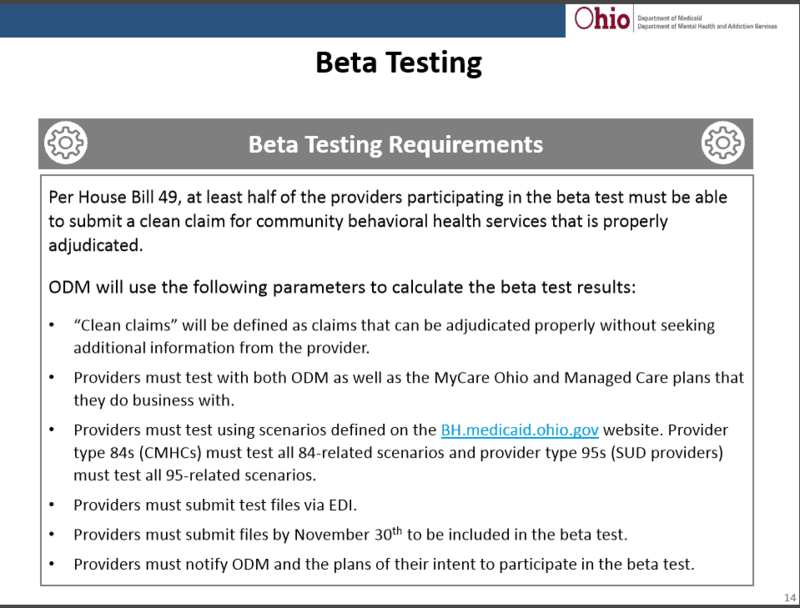 If you are not in a MyCare area, you may still be a beta tester or test outside the beta testing group. Everyone can begin testing October 25th, only true “Beta Testers” will be reported back to legislature. 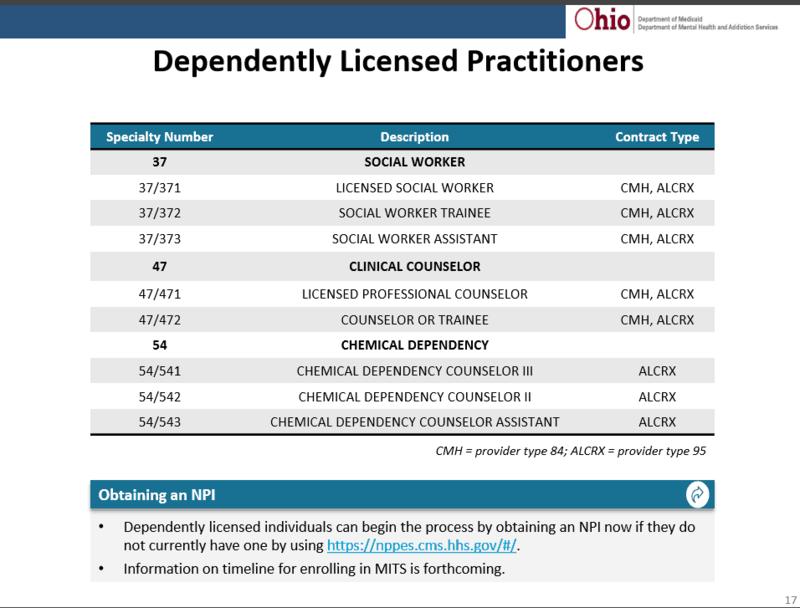 As for registering Dependently Licensed and Unlicensed Providers, the categories and specialties have been assigned. The recommended practice is to begin applying for NPI’s today as an increased lag time in receiving requested NPI’s has already been reported by several agencies. 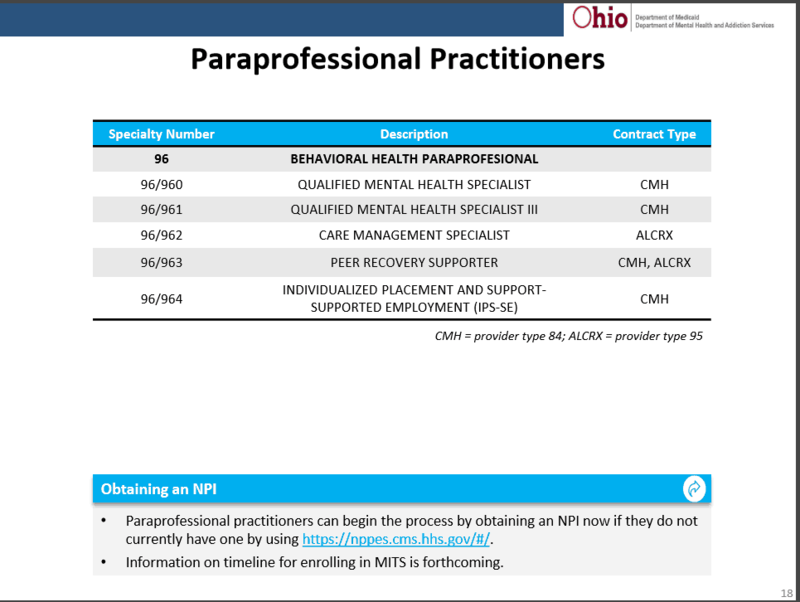 For specific guidelines on best practices related to registering for NPI’s and Medicaid, contact BHBS. We now offer a “FULL START TO FINISH REGISTRATION SERVICE“ to ease some of the burden this additional requirement adds to agencies as they transition. 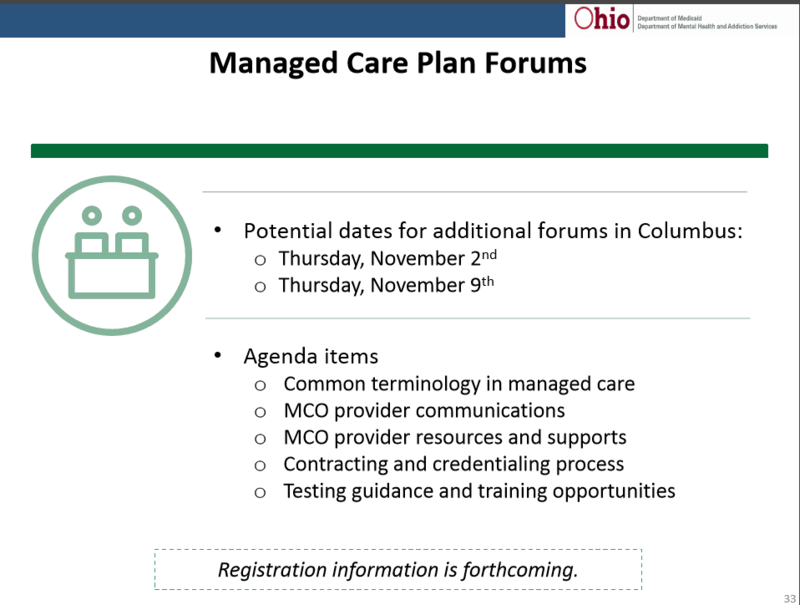 Also, additional MCO Forum dates were announced. Keep in mind, these forums are designed to give you direct access to the contacts for each Managed Care Company. They are not designed to train you on how to contract and credential as each MCO has a different process. Once registration is open, I will post but be certain they will fill up quickly so sign up as soon as you see it. In addition, the recently released MCO Resource Guide can provide a significant amount of helpful resources and information. 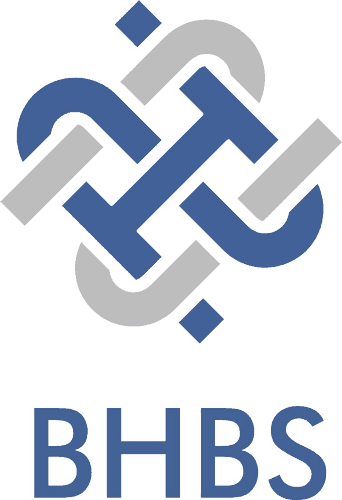 As part of the Managed Care Carve in, a universal Prior Authorization form is being created for use for ALL MCO’s. Below is a draft of this form. Unfortunately, it is a paper form that will need completed and returned to the participating MCO instead of a website portal, as originally presented by Medicaid and the MITS portal so be sure to pay close attention to the timelines and requirements for submitting and expecting a response to these prior authorizations. And lastly, the Health Home timeline has been adjusted. There were no clear answers as to whether TBS or PSR would be impacted by the continuance of the Health Homes status that I was able to grasp. I believe CPST will be still be denied if provided to a client enrolled in a health home but provided by another agency. The other new services I would recommend waiting on more detailed information. Right now, my recommendation is to begin building your clinical workflow, testing your billing process (refining as needed) and register and test with any MCO you can. 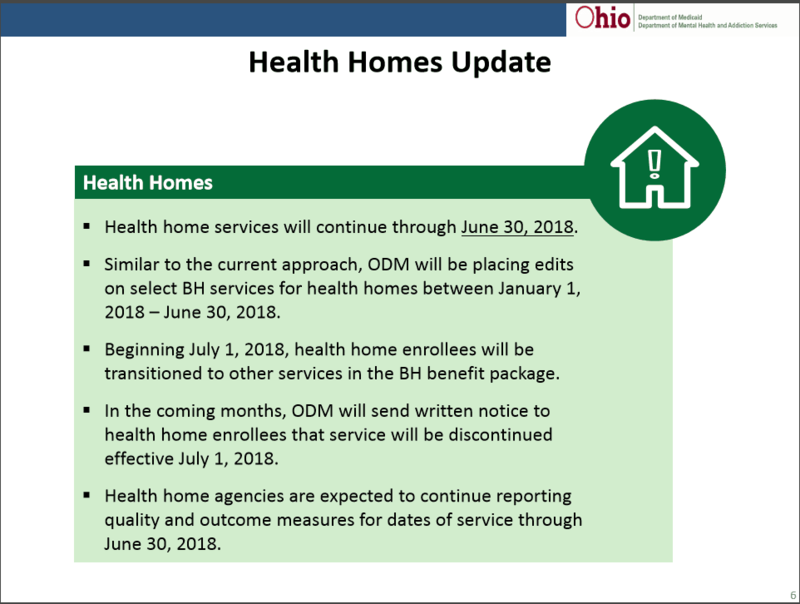 More info will follow soon because, as always, BH redesign in Ohio is a moving target.